When you feel like your working mom life is too chaotic it’s time for more than just a mommy timeout. It’s time to decompress and meditate. Most of us know meditation is good for you but stopping and sitting seems impossible. There’s just too much to do! Lack of time is the problem that meditation can solve. 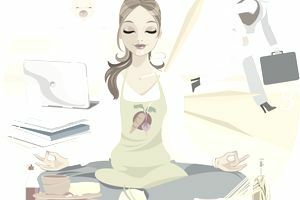 Let me convince you that investing in meditation practices is the best time management tool. When you’re running in a non-stop marathon your brain can become unbalanced from stress or anxiety. One side of your brain is working harder than the other and then the two falls out of sync. Meditation allows your brain to become balanced again. For example, let’s say you stay up late trying to solve a problem. In the morning you magically think of the answer! You think to yourself, “Why couldn’t I figure this out last night?” What happened while you were asleep is that your brain found its center. It became balanced again. Meditation can give you the same results. When you are juggling many tasks or decisions, you make it worse by stressing about resolutions or trying to organize your life better. If you stop what you are doing and relax, it gives your brain a chance to balance itself. Sitting still in silence is glorious, isn’t it? Your marathon or sprint interval training ends. You sit comfortably with your eyes closed ready to retreat to tranquility. No need to watch children jump around or play referee. You give yourself permission to release the pressure of working on your to-do list, emails, or chores and you just sit still. This may be the hardest part! You’ll feel accomplished but still tired. That's not really good. You’ll get to check something off your to-do list but how does that make you feel good in the long run? In five years from now will you remember how good you felt from folding clothes? Think about how much time you spend on negative emotions like worry, stress, anxiety, anger, or guilt. If you spend time meditating you are lessening these emotions and as a result will spend less time dwelling in them and more time in a relaxed state. Meditation leaves you feeling released of something. It leaves you feeling a bit more peaceful. Let the family pick from the wrinkled clothes in the morning and choose to sit still. You always have a choice. Make a choice to sit then take a few deep breaths. Think about how your body is moving while you inhale and exhale. This is meditation in its most basic form. Thoughts will come into your mind, they always do, but you can chose to decide that they don’t matter at the moment. The only thing that matters is your breath. It doesn’t matter how long you meditate for initially. Try not to stress about how long you sit for. Give yourself permission to not feel guilty about sitting still. The itch to move may happen but with practice it will subside. Keep with your meditation practice to discover for yourself how you feel afterwards. The effect of meditation may pleasantly surprise you. In five years from now you may be a different person and your family will love you for it.